Paranormality: I missed participating, but I highly recommend it! I missed participating, but I highly recommend it! 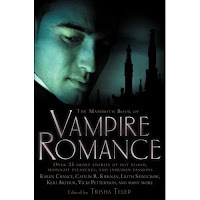 When Trisha Telep contacted me last year about writing a story for her upcoming, MAMMOTH BOOK OF VAMPIRE ROMANCE, I was bummed. The story would have been due right around the time the second book in my Kismet Knight, Ph.D., Vampire Psychologist series had to be turned in (and I was still madly writing), so I had to, regretfully, decline. It wasn't in the cards for me to participate then, but I can't wait to read it when it comes out this summer. And Trisha invited me to participate in the MAMMOTH BOOK OF PARANORMAL ROMANCE, which will be released February, 2009. I'm excited!